Would it surprise you that my laundry still needs folding, but I have blocks to show you anyway? It doesn’t surprise me a bit – but it is still early on Sunday. Might get to that laundry yet. Block 6 from Reach for the Stars is, to me, the easiest block so far. Four HST units in the corners and 5 hour glass blocks. I pretty much made up my own directions and used the easy method for hour glass blocks and cut my squares at 5 1/2″ (probably could have been 5 1/4″, but I wanted to be sure to have enough room to trim evenly). I still need to add the black sashing, but here’s the last block for now – until a new issue of Quilters Newsletter arrives! (Please, please, please ignore my ugly foot in this picture). The outer corner fabric is from Palm Court, the two light fabrics are from Little Black Dress II and the other black/tan fabric is a new addition from Little Gatherings by Primitive Gatherings and it is called Raven Star Shower. I already had quite a bit of grey polka dot yardage from Vintage Modern (Bonnie & Camille) and it goes wonderfully with this linen-look collection. I couldn’t wait to make my first block! And here is the final block, squared up to 12 1/2″ unfinished. I’m sure this would go much faster if I had everything cut now and decided on all the combinations of fabrics, but that isn’t really how I roll. 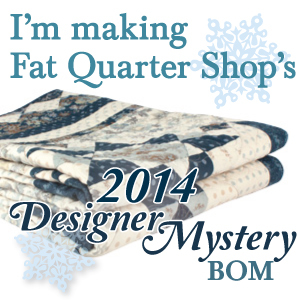 There are a total of 20 blocks in the quilt top and it calls for a few more fat quarters than I have in this bundle. I’m going to mix in some Wishes fabric by Sweetwater. I have two charm packs of it and many of the colors will go great. My Avalon house block will have to wait until later tonight, or this week. I really had to get this one block done – it is so Springy! Plus, I have a couple of housewarming quilts that need to be made in the next couple of months and I think this will be one of them. Enjoy the remainder of your weekend and thanks for stopping by for a visit! Are we supposed to fold that stuff still? I thought we got over that silliness. What book is your granny square in? I love that idea and your fabrics are adorable. For the quilt, I am following the pattern in Lori Holt’s new booklet (just released a week or two ago) called ‘Great Granny Squared”. I got my copy from fatquartershop.com.